Bulgarian Split Squats Benefits: How To Do It? Are you looking for more information on how bulgarian squats are good for your overall physique? Squats are one of the primary movements that people need to focus on to build an overall awesome physique. Along with deadlifts, squats are one of the best compound exercises to get an impressive build. In fact, most fitness trainers consider the squat as a cornerstone to get a fantastic lower body build going. What are The Benefits of Squatting Every Day? What Are Bulgarian Split Squats? What Are Split Squat Jumps? There are very few exercises that you can do every day without risking overtraining. Squats are one of them. It’s easy to see why because it builds strength, power, flexibility, and balance all at the same time. Also, regardless of your fitness level, squats can definitely work to benefit you. When you squat, you build a lot of power and strength in your glutes, hamstrings and quads which are stabilizers when you are moving around in any field of sport. Weighted squats help a lot with muscle-building hormones which strengthen the whole body. Weighted squats can burn fat right off your body and this will help you get more ripped. You will develop lean muscle which is a definite plus when you are looking to get a toned physique. If you want enhanced mobility in your lower body, then squats are definitely the way to go about it. It is also purported to reduce pain in your lower back and also work therapeutically to overcome knee pain. You can also read our guide to increase your squat weight with a good quality squat cage in a short period of time. When it comes to a comparison between 2 of the most popular exercise movements, squats and deadlifts, you will find that there is no clear winner. Both have their own pros and cons when it comes down to it. Both exercises help you develop a strong core and are equally effective at increasing flexibility and promoting mobility. It really comes down to choice and what you prefer to be honest. The only difference being that if you are looking to move a massive amount of weight, then a squat might be a bit too much and you will be better off when you opt for deadlifts. There are close to 40 different types of squats people do. But listing them all with their slight differences might be a bit redundant. So let’s reduce fluff and go with 5 most popular variations that you’ll find gives you better chance of getting that physique that you’ve always wanted. What we are going to do now is touch upon one of the most popular squat variations which has a lot of benefits. I am talking about the Bulgarian split squats. Also known as a Rear Foot Elevated Split Squat (RFESS), this particular type is, in fact, a variation of a traditional squat, but that it's performed with one leg. Being a single exercise, it can resolve weaknesses or muscular imbalances. RFESS is an exercise based on a triple extension movement like the hips, knees, and ankles. The split squat exercise involves moving to an extended position from a bent position when the joints are ready to move. This is an interesting variation on the split squat that increases your “explosive power” which helps you a lot in sports and sometimes even during day to day activities. Fitness trainers recommend this method of exercise to build strong legs and a core. Since this is a high impact exercise it requires good joint stabilization along with considerable muscle strength to perform it effectively. It is also classified as a plyometric exercise because of the “jump” included that aids in explosive, concentric contraction that is preceded by an eccentric contraction. A lot of people have responded saying that plyometric exercises have increased their ability to carry out everyday functions more effectively. Although they are not as common, these type of exercises will help you train the lower part of your body and will have an amazing effect overall. By putting more group muscles to work, you will be in shape without the help of any fancy equipment. They represent a form of exercise, especially for the lower part of the body, that requires no spotter. They work the upper leg muscles, as well as the glute muscles. If you don't have access to a gym or don't want to leave your house, but still want to train, split squats will do the trick. They also don't require any specialized equipment, so it's up to you if you choose to use some dumbbells for extra effort, or not. Unlike the regular squat, a Bulgarian split squat will help you progress efficiently but during a longer period as opposed to a traditional squat. Some trainers say that it is, in fact, a better exercise with more potential than bilateral squats. It doesn't put pressure on your back muscles while working out, as traditional squat do, and provides support on the lower back. In the case of an injury, this type of split squat will help you get in shape without damaging the muscles. It increases the hips’ mobility. Thus, it is an excellent method for people who desire to further extend their training to other bodybuilding movements. The pressure put on the bent leg is higher than it is in the case of a bilateral squat, so practically, the muscles can develop faster. A single exercise will help your body to develop an overall symmetry. More flexible joints will keep you stay away from serious accidents by allowing your body to react faster. So, you will diminish the risk of injuries. This exercise has proven itself to be effective even done without weights and at a slower pace. Toning your body and developing a six-pack is more likely achievable by doing Bulgarian split squats than crunches. By maintaining your balance on a single leg, you will increase your stability level, as well as improve your mobility and flexibility. By combining it with a barbell supported on the upper back, a Bulgarian split s﻿﻿quat can be transformed into an elaborate exercise part of your daily routine. Repeat the squat alternating legs. If you are more experienced, a Bulgarian split squat can be taken to the next level. 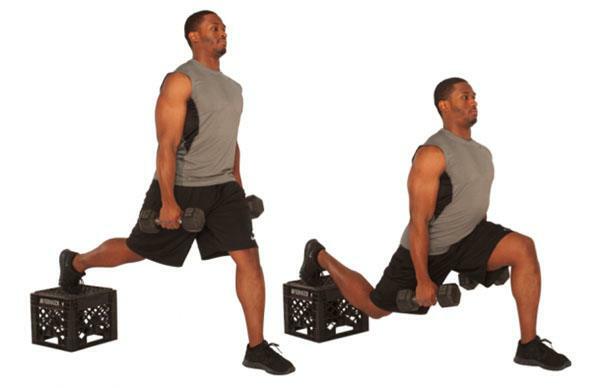 For this, you can use overhead split squats, bodyweight split squats, kettlebell split squats or plyometric split squats. Bulgarian split squats represent an excellent workout method for people who desire to get in shape. These exercises can also be solutions for those who had a muscular problem that they want to address, or would just like to diversify their workout.